Bonus Story: Feasting on Memories (Epilogue & Commentary) | Home of the Thurian Saga Books! An extension of the story told in Purebred (available as an eBook and audiobook)! “Matron!” Sahni gasped, but then she, too, was pushed hard off her hind paws. However, unlike her matron, Sahnassa rolled to one side, her paw instantly lighting on her stunner thanks to some of Vanarra’s training the last evening they were together. Looking up, she saw a masked Nephti holding a knife. “All of your money and jewels and – aheeeeeeeee! !” Astalla watched in surprise as with one fluid motion, Sahni brought her stunner out and fired straight at their assailant, landing a perfect hit. As the stun bolts forced him into uncontrolled paroxysms, his muscles completely overcome, he screamed as best he could through clenched jaws and a bloody tongue that he’d bitten hard into. Falling over, he never got the chance to move again before Sahnassa’s stunner jabbed into his backside, nailing him with the powerful sedative mixture. “He assaulted us, Sahnassa, threatened us. There’s no way around that fact,” Astalla challenged her as distant voices shouting for the matron started to be heard. “I hope that, too,” Sahnassa added as the guards pulled the bound male up off the ground. First, I have to say that the artwork by Kat Miller is amazing for this! 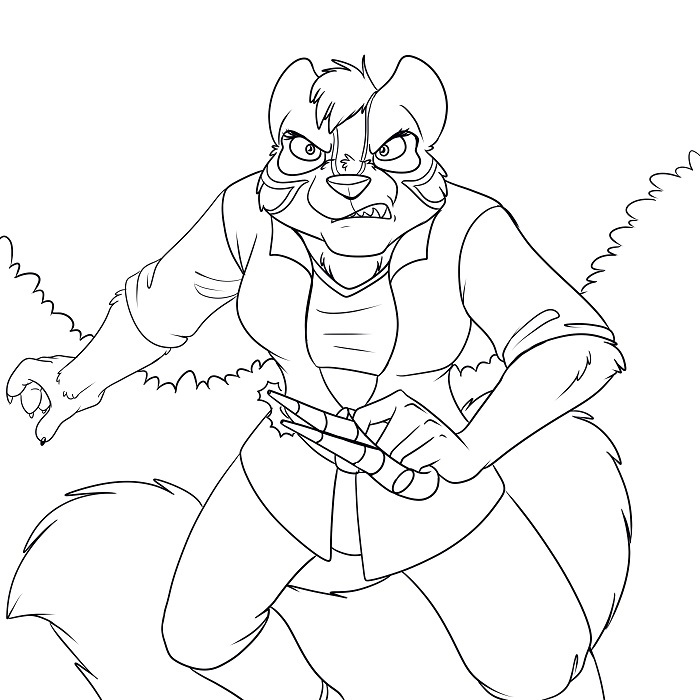 Sahni looks dangerous, and for her, that’s saying something! Now, a few notes on this. Those with a penchant for detail will have doubtless wondered where and how Vanarra gathered her driving skills and her fighting skills (also how she knows Kylie). This series is intended to answer that, introducing us to a younger, more vulnerable Vanarra who – for a time – lapses into a strong dependence on someone she shouldn’t have. I’m also going to tell you how I got the idea for this story. On one of the popular “on-demand video services” we subscribe to, the old TV show Airwolf was available, and so as a once fan of the show (and someone who likes to play the soundtrack), I watched the pilot. I have to say that I was a little stunned by it. Sarlankar is modeled on Stringfellow Hawke, and if you watch the pilot, “Arch Angel”/Michael comes to Stringfellow’s wilderness home to try and convince him to take a mission. He brings with him some 1980’s arm candy in the form of a female associate. During the night, the female makes a non-too-subtle attempt to seduce Stringfellow, and he flat out calls her a “whore” to her face – DUDE, right on 1980’s network TV!?!?! Well, that struck me a bit, and that kind of started the idea of Sarlankar. So, take that dark, stoic nature of Stringfellow and place it into a character with a much darker profession, someone who has just a sliver of light left in their soul, and there you go. In the hotel where he saw Van take down her three adversaries, he could have been resting up after a particularly difficult job that involved a lot of fighting. For grins, he flicks out his PawLink and starts recording a potential rapemating, but it’s her fighting that initially attracts him to her. Realizing that she’s going to die in jail, he reluctantly intervenes, but then decides to take her on as a little side project between jobs. We can imagine that Sarlankar always studied his targets, and those same skills just click in when he decides to start digging into Van’s past. In the end, he doesn’t find someone who is a target; he finds someone who has a soul good enough to almost save him from destruction … almost. If you’re wondering about Sarl’s final state, Van said it – he’s dead. He’s not merely dead; he’s really most sincerely dead, and he would not be someone that the Allarrae would ever go back and pluck up for the colony; sorry about that. He was someone lost in darkness who finally died that way, his final moments with Vanarra his very last chance that he could avoid his doom. Here’s hoping those we know and love can do better.